It turns out, politicians don’t like to touch this subject, especially in the United States. A 2007 Farm Bill amendment that would have cut subsidies for meat and dairy industries was rejected by House Democrats, because House Leader Nancy Pelosi feared Democratic representatives would risk losing their seats in the 2008 elections. As for the European Union, which many say is “leading the way” for climate change reform, politicians are almost just as hesitant. The EU recently issued a warning about the impact of livestock on the environment while omitting text calling for a worldwide reduction in meat consumption. However, no direct action was taken that might help to reduce meat consumption or the number of livestock. Governments are taking no steps to influence the individual’s decision to eat less meat. Wait. Let me take that back. The government IS influencing you. It is subsidizing meat to allow it to be very cheap and very affordable, at the cost of our environment and health, with our taxpayer money. But who’s complaining? How much of the public cares? Where is the rallying cry from progressives, global warming activists or environmentalists? Where…is Al Gore? Hollywood? Many leaders have helped to put global warming in the spotlight and to “go green”. And for that we owe our gratitude. But many of these same “leaders” have failed to act and speak on the environmental impact of livestock. It is no wonder politicians don’t care to make this an issue. “We have exempted agriculture from the climate protection strategy in order to limit the number of potential sources of conflict,” says a senior member of the staff of Environment Minister Sigmar Gabriel, a member of the Social Democrat Party (SPD). So why aren’t politicians including livestock in climate policy? Why does a salad cost more than a Big Mac? Because there is a need for new leaders and catalysts for change. People need to see and hear, how and why, hundreds millions have already made the choice to adopt a low-meat or no-meat diet. Over the next five years, US farms will receive 288 billion in federal subsidies. 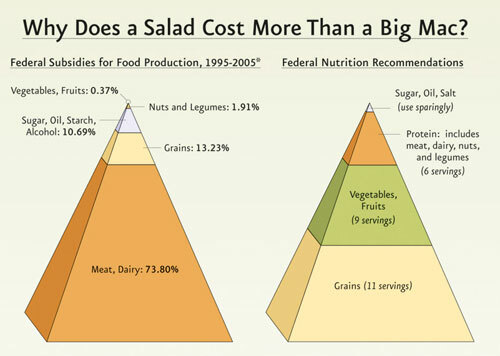 The graph below displays the percentage of subsidies addressed to the different groups of the food pyramid. Ending or at least significantly reducing subsidies for meat and dairy industries, will force them to bear their own resource and environmental costs, and to cope with less funds to market their goods to the public, or to lobby politicians.